Billy Graham dies: What was his real legacy? Billy Graham, the American Christian evangelist who preached to millions around the world, has died at the age of 99. The evangelical leader prayed with and counseled the most powerful and well-known figures of the late twentieth century, including every U.S. president from Harry Truman to Barack Obama. Billy Graham has passed away at his home in Montreat, North Carolina, a family spokesperson confirms. While Billy Graham seemed sincere, he did not preach nor understand the true gospel (see what is the Gospel? as well as the free online book The Gospel of the Kingdom of God). 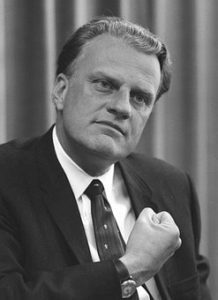 Billy Graham was probably the most well known Protestant preacher to compromise with the Church of Rome. A disturbed Roman Catholic wrote Graham about some of the changes going on in the Catholic Church. In his answer, Graham wrote, “Above all, don’t pull out of the church! Stay in it, stay close to the Lord, and use these experiences as an opportunity to help your church be what God intends and what the world needs.” What an answer for a Baptist preacher to give. This was published in his newspaper column, “My Answer”. Perhaps I should add that the falsely labeled magazine “Christianity Today” had a piece about Billy Graham that I read years ago where Billy Graham was explaining that he had become more supportive of the Church of Rome. The fact is that Billy Graham was not willing to step out and defend his original faith, let alone the true faith of the Bible. He, and others, signaled changes within the Protestant world. 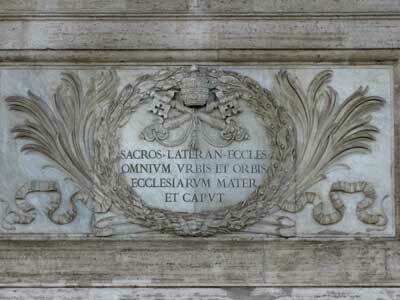 The Apostle John, we have said, speaking of the apostasy, the coming of which he predicts, styles it the “Antichrist.” And we have also said that the Papacy, speaking through its representative and head, calls itself the “Vicar of Christ.” The first, “Antichrist,” is a Greek word, the second, “Vicar,” is an English word; but the two are in reality one, for both words have the same meaning. Antichrist translated into English is Vice- Christ, or Vicar of Christ; and Vicar of Christ, rendered into Greek is Antichrist — Antichristos. If we can establish this, and the ordinary use of the word by those to whom the Greek was a vernacular, is decisive on the point — we shall have no difficulty in showing that this is the meaning of the word “Antichrist,” — even a Vice-Christ. And if so, then every time the Pope claims to be the Vicar of Christ, he pleads at the bar of the world that he is the “Antichrist. Yet, now many Protestants no longer believe doctrines like that. Of course, the Continuing Church of God is NOT Protestant (see Hope of Salvation: How the Continuing Church of God differs from most Protestants) as we trace our history back to the original apostles and do not hold many doctrines that the Protestants kept from the Church of Rome as opposed to the Bible (see Continuing History of the Church of God). And I believe that those who truly wish to follow the cry of sola Scriptura will be led by God to support us (see also Sola Scriptura or Prima Luther? What Did Martin Luther Really Believe About the Bible?). But Billy Graham did not. Compromises with the Catholics of Rome clearly will help the Beast (see Europa, the Beast, and the Book of Revelation) and the False prophet (Two Horned Beast of Revelation and 666) as they rise up (most likely in the next decade, see Does God Have a 6,000 Year Plan? What Year Does the 6,000 Years End?). Billy Graham was a leader in the compromise–and that is his real legacy. Others have, sadly, followed his lead. People need to be grounded in the Christianity of the Bible and not the compromised versions that the majority of those who profess Christ follow. Few people realize how fast the ecumenical movement is moving now. Yet, because of biblical prophecies, this has been expected. That is the system that the ecumenical movement is trying to prop up. This is the system that Billy Graham, unwittingly, endorsed. Since Billy Graham claimed to preach the Bible, he should have known better. Beware: Protestants Going Towards Ecumenical Destruction! This entry was posted on Wednesday, February 21st, 2018 at 6:30 am	and is filed under Religious News.